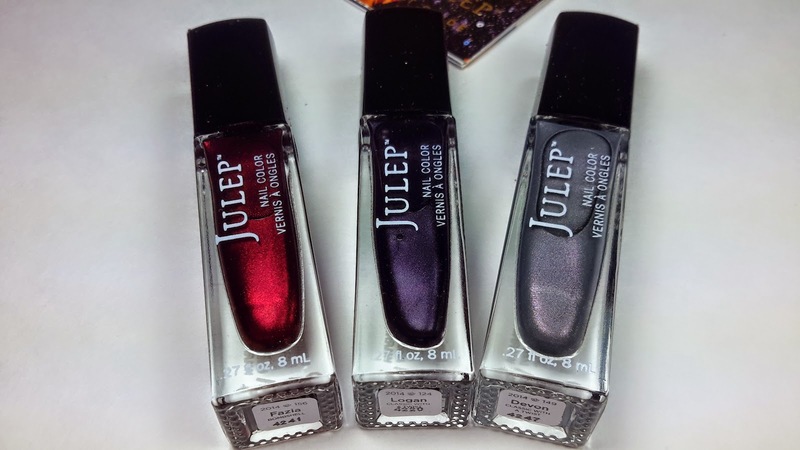 Julep has some wonderful holiday colors out for November 2014 and I got three of them in my Maven box this month! Normally I'm a Bombshell but for whatever reason I decided to go with Classic with a Twist this month. I did swap out one beauty product in order to get another polish. What You Get: A customizable box of full-size, limited-run nail colors and beauty innovations. You can see what is in your box each month and have the option of swapping out colors/products you already have or don't want. Here are the colors I chose for this month. Fazia, Logan and Devon. Fazia is a Bombshell color but Logan and Devon were both from the Classic with a Twist box. I didn't need mascara so I was glad I was able to switch it out to get one more polish because all of these are fantastic colors. Fazia- Liquid Garnet Shimmer. This color is absolutely gorgeous. It's a deep burgundy red and has a shimmery finish to it. It goes on beautifully in one coat and dries very quickly. I'm super impressed with this polish. It's rare that I find one so pretty that also has good formulation. In my opinion, Fazia reaches perfection. Devon- Slate grey with fuchsia microshimmer. This polish is also opaque in one coat. It dries quickly. It's shimmery and silver and the fuschia microshimmer that's added gives it a lovely warmth. This is not a dead, flat gray. This is a luxe, vibrant silver and will look so good with a holiday outfit. You'll have to pardon the blurryness of this photo but I *really* wanted you to be able to see the pinky shimmer and this was the only picture that really picked it up in the bottle. Logan- Aubergine shimmer. This is a definite eggplant color. It needs two to three coats to look good. It's a rich purple color and it does have a great shimmer. It's beautiful! I was just spoiled by the first two colors only needing one coat. VERDICT: These colors are truly beautiful and I was glad I could choose what I wanted to put in my box. All three shades are something I wanted and they turned out to be even better than I expected. Being a Julep Maven has been a lot of fun because of the ability to customize. I've been able to get all sorts of products besides nail polish, too, which is very helpful. Then as a Julep Maven subscriber, you also get 20% off shop products, free shipping, and access to the secret shop at the beginning of each month. If you would like to get Julep Maven box of your own, you can sign up right here! If you use the code TREAT, your first box will be free and you will get a special Holiday Edition box with three polishes and an eyeliner! You do have to pay shipping but for $2.99, that's a great deal! If you are looking for gifts and you have a beauty or nail polish fanatic in the family, you can give a Julep Maven subscription as a gift!